One of the best things in comic books is when competing publishers come together to make great stories. Marvel and DC have done it several times. DC and Dark Horse have also did it for Batman vs Predator and Image and DC even came together to set the caped crusader against Spawn. 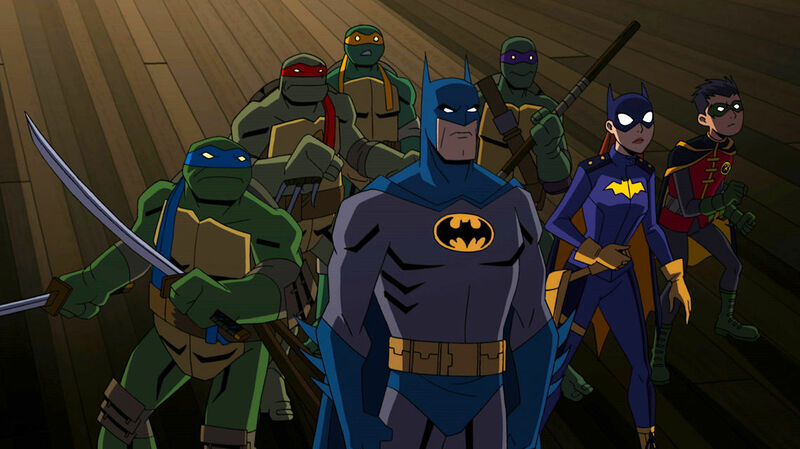 Now the 2015 crossover between IDW’s Teenage Mutant Ninja Turtles and Batman is set for an animated adaptation that will be hitting blu ray later this spring. In the story, the two comic icons meet thanks to some inter-dimensional hyjinx. 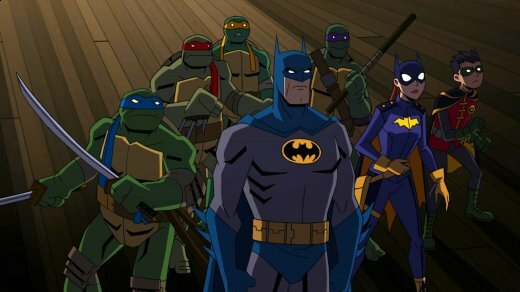 As you’d expect Batman throws down with the Turtles before they come together to take on some of Gotham’s greatest rogues. Fans of the Turtles who aren’t loving the current art-style of Rise of the Teenage Mutant Ninja Turtles will be happy to see from the image below that we’ll be getting a more traditional turtle in the film. Meanwhile, we also got a look at the voice cast today and it is shaping up to be great! Troy Baker will be the first voice actor to ever play both Batman and the Joker. He’ll be joined by Darren Criss as Raphael; Kyle Mooney as Michelangelo; Baron Vaughn as Donatello; Eric Bauza as Leonardo; Rachel Bloom as Batgirl; Tom Kenny as the Penguin; John DiMaggio as Mr. Freeze; Tara Strong as both Harley Quinn and Poison Ivy; Carlos Alazraqui as Bane; and Cas Anvar as Ra’s al Ghul.